This pattern is in my wardrobe plan, but I was sent a fabric different than the one I ordered. Since I wanted to get my February Burda project out of the way, I decided to just make it up with something in my stash. I'll make it again for the wardrobe once I get the correct fabric. Silk jersey from Gorgeous Fabrics. I bought it nearly a year ago... Yes, those are black owls with bursting red tails that you see. My husband was sitting at the dining table when I was cutting the fabric. He kept looking at it funny but he knew better than to say anything. This is essentially a t-shirt except there's no hemming to do because the neck, sleeves, and waist are finished with bands of doubled fabric. Easy! The waistband is drafted to be 4 inches long when finished. I was worried about the top being too short so the finished length of my waistband is 5 inches. 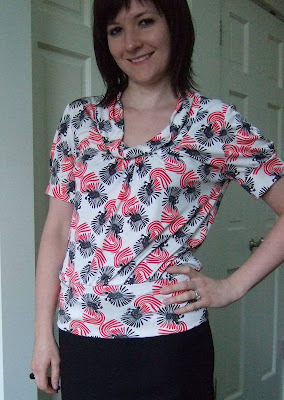 Easy top, I look forward to making it again in knit gauze. Looks great! I LOVE the fabric, and have yet to make something out of silk jersey - silk jersey reminds me of Vionnet! Lovely t-shirt. Might be just the one for a fabric I have too. Lovely top! I wouldn't have given this pattern a second glance but it really suits you. Enjoy the mountains. Love it! This is going to make a great work shirt. I'm planning to make two of these as well! That turned out beautifully! I'll have to check that pattern out now. yup, that style is great on you! Fun fabric, I'm sure it feels dreamy too. Great fabric! 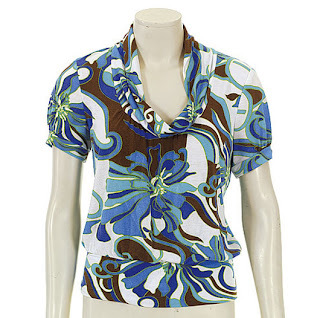 I liked this top from BWOF a lot too. I think I will sew one too. So stylish, I love this! I need to get some gorgeous fabrics ASAP! Gorgeous looking top! It suits you perfectly! Too Cute! Wow...its short sleeve season already! Looks fantastic! I'll make a note of the pattern number. I'm so frustrated that I only just got BWOF December 2007 issues today in the mail (in Australia). That is really cute on you. LOVED the husband comment. He is a wise one. *wink*. Thanks for locating Adrienne's "camera" post for me. I really appreciate it. By the way, you must have one of the fastest needles in cyberspace. You seem to complete so many projects in such a short period of time. I love your stuff. Oh, wait! That's Kenojuak Ashewak's The Enchanted Owl! Wow! This top looks lovely. Can you explain how the neckline is cut and sewn? 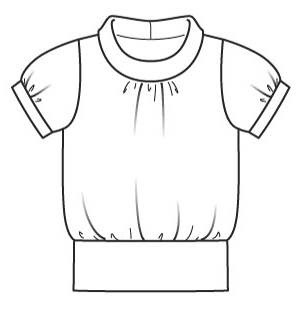 Linley - The neckband is just a long rectangular piece the same width as the neckline - you stitch the ends together, fold it in half lengthwise, then stitch it to the neckline.